There are many rare cat breeds that have not been known of until modern times. Some can be quite old breeds, some are the result of a spontaneous mutation that may have happened only a short while ago. These are cats you may not even find in your own country. The breeders may interview you deeply before deciding on selling you a kitten, so be prepared for it. 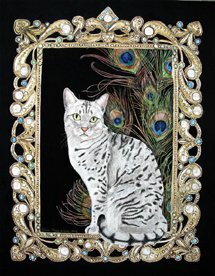 The Egyptian Mau is the oldest cat breed in the world - and genetically proven to be so. 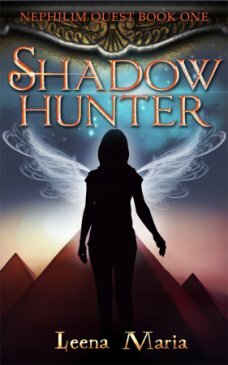 Already revered by the Egyptian Pharaohs in ancient times and saved as a breed by a Russian Princess in the 20th century - a breathtaking story of a cat breed of breathtaking beauty. 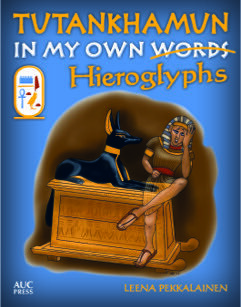 Read about the ancient history of Egyptian Mau here. 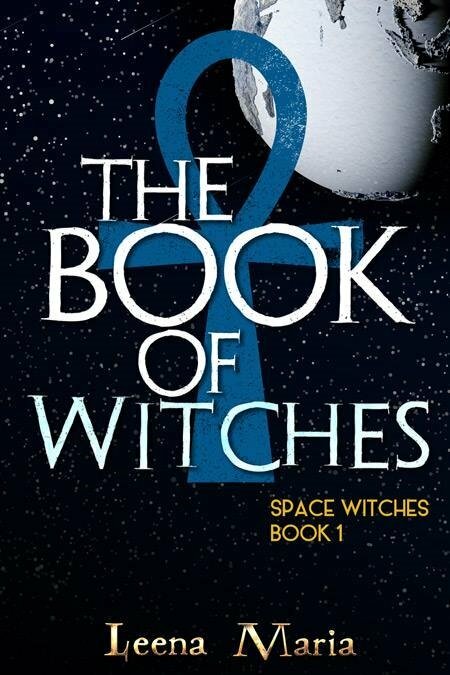 More recent history of the Mau. 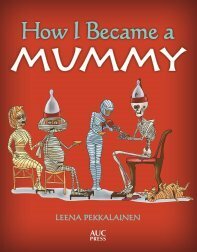 What is a Mau like as a family member? One look at those huge jewel-like green eyes and the silvery shiny grey coat and you understand why this lovable and loving little cat is much sought after. This is one of those naturally developed ancient breeds, originally from the Malay peninsula in the Orient. It is a healthy breed, very loving towards humans, and so very very beautiful. 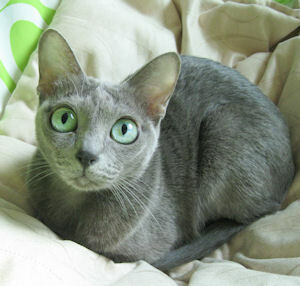 Why do they say a Korat has five hearts? You can read more about the Korats by clicking here! More info about Korat's looks. And a page for Korat breeders. You might think this is a wild cat, looking at those spots and that hunter's walk... But the Ocicat is actually a totally domestic breed with a lovely, friendly character. 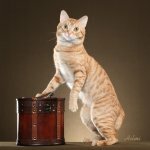 Originally it was a mix of Siamese and Abyssinian, later spiced up with American Shorthair. And the result is a cat of breathtaking beauty... It is still considered to be one of the rare cat breeds. The "Cat of the Connoisseur" it is called - and for a very good reason. 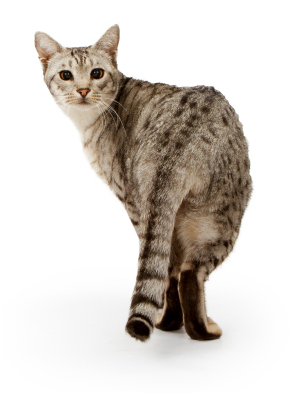 Read here about the Ocicat's history. Here is information about what the Ocicat cat is like. If you have ever seen a Scottish Fold cat, one of the rare cat breeds of the world, you never forget it. It is simply way too endearing - huge round eyes, and at first it looks like the cat has no ear. It really reminds an owl. But whoever has owned a Scottish Fold, swears they are the most adorable of cat breeds. Why? 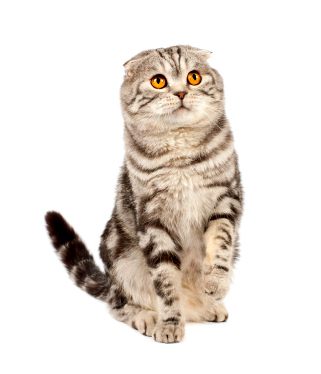 Here is information about Scottish Fold's looks and health. More reading about Scottish Fold's colors. And a page for Scottish Fold Breeders. Singapura is the Cinderella on the cat world - rising from the drains of Singapore to one of the most loved cat breeds of the world. The smallest recognized cat breed of the world. 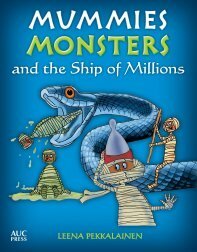 Adorable little curious creatures, bound to keep you entertained. 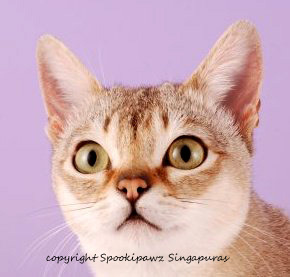 You can read about the history of the Singapura cat here. Interested in Singapura's looks? You'll find info here. This is a page for Singapura breeders. And here is a page for Singapura rescues to tell about their work. The tiny tame tiger cat - bred to look as much like a tiger as possible. Still, despite its wild looks it is bred from domestic cats. 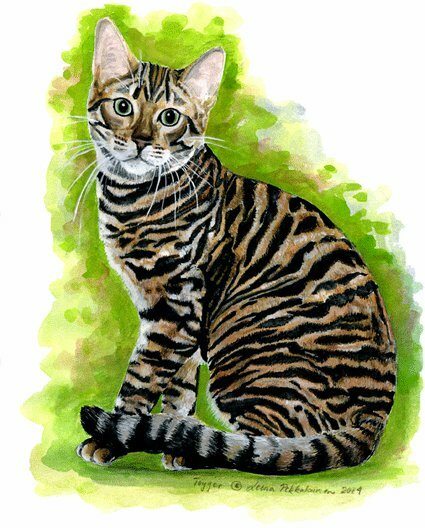 Many Toyger breeders give part of the payment for a kitten to tiger conservation. It is really beautiful - click here to read more about this gorgeous, rare breed. If you became interested in these rare cat breeds, choose your breeder carefully. Be certain you won't get your kitten from a kitten mill, and check the reputation of your breeder from local cat breeders' association first. This is to ensure you get a health kitten who will be a joy for you and your family for many years to come. Irresponsible breeding can cause illness and suffering. 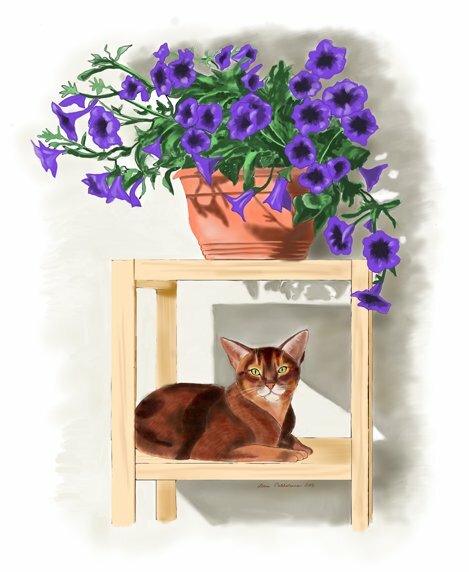 If you are interested in seeing the painting above and other cat art closer, click on the picture or here.